One Ocean Film Festival – Eco Alianza de Loreto | Loreto, B.C.S. Four films – two magical nights under the stars! Join us for Eco-Alianza’s first annual “One Ocean Film Festival” – a two-evening event that explores the miracles of the ocean that we all share. Come for one or come for both! This year’s festival offers four captivating feature films shot almost entirely in the Gulf of California and the Baja Peninsula and are perfect for both English and Spanish speakers. The images in these films communicate the message: we share these waters with some of the most amazing creatures on the planet. Presenting the films will be award-winning cinematographers, directors, and conservationists who will discuss their work. Eco-Alianza staff will be available before and after the films to answer questions about conservation projects in which they are involved. Free popcorn is included with your admission. Wine, soft drinks, and appetizers will be available for purchase. Seating is limited, so buy your tickets now online or in the Eco-Alianza lobby. Doors open at 6:45 pm, so plan to arrive early to get your favorite seats. Lights go out and our program begins promptly at 7:35. Plan to be seated by 7:30. 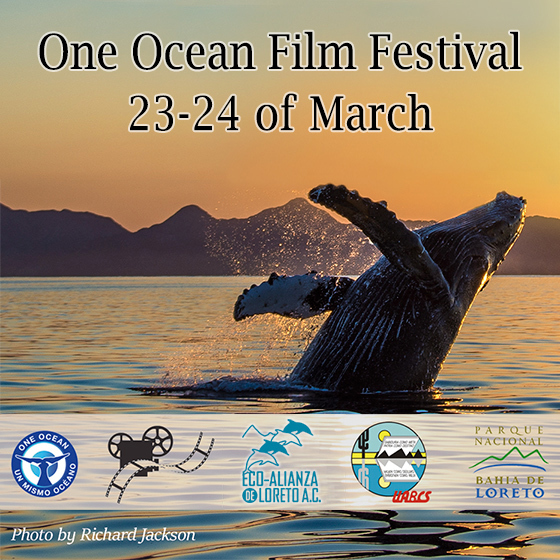 The “One Ocean Film Festival” is a partnership between Eco-Alianza and the Parque Nacional Bahía de Loreto and UABCS.